Welcome to apply for residencies for March-December period in 2013 - deadline for residency applications is February 15, 2013. NAC is located in a remote and beautifully distinct landscape next to the resort town of Nida. The residency is most appropriate for those artists who are seeking time for experiments and research, value the creative process and a big studio or open-air space as well as for those who love coincidences and the chance to meet artists from all over the world. Parallel to the residency programme, the Colony building also hosts student workshops and international artistic projects for shorter periods of time. The Colony provides the necessary living and social conditions to ensure a comfortable environment for the five artists-in-residence. Each of the five residencies is set out on two floors with 65 square meters of floor space and feature all the necessary facilities. The colony is situated about 600 meters away from the sand dunes, and the beach. More information on activities (like the curated exhibition Taking Time) and facilities can be found on our website and Facebook. To get a sense of Colony life and to see A.I.R. portfolios, please check the Nida Art Colony Log. Two types of residencies are available: individual and thematic residencies. Please indicate the selected type of residency in the subject line and follow the application guidelines. Techno-ecologies collaborative residencies are offered in partnership with RIXC. Please send your project proposals based on the keywords and your initial research on the specific Neringa issues. Keywords and more information are to be found here - Techno-ecologies. Individual and group (up to four persons) applications are welcome from artists, researchers, scientists, producers and curators. Grants: There are five grants available, 700 EUR/month , travel (up to 350 Eur), studio, accommodation and production costs (subject to availability). Applicants from Europe may apply. 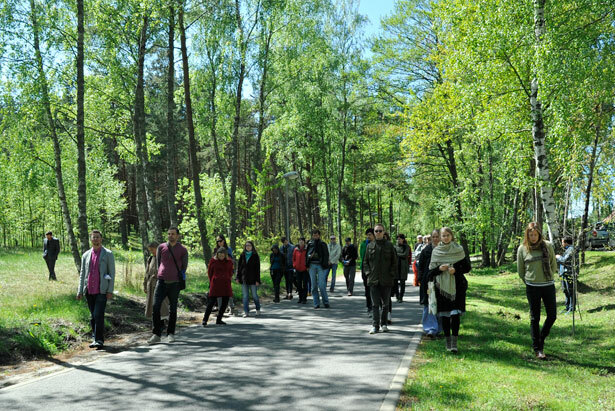 Critical tourism residencies are intended for artists who want to develop a site-specific work relating to Nida and its touristic aspects. More here about the project On Hosting and Displacing. Grants: There are two grants available, of 700 EUR/month, travel (up to 350 EUR), studio, accommodation and production costs. Applicants from Switzerland and Nordic-Baltic countries may apply. Thematic residencies are supported by the EU Culture Programme, Swiss Arts Council Pro Helvetia, Nordic-Baltic Mobility Programme for Culture, and Vilnius Academy of Arts. Duration: one to four months, between June and December 2013. The recommended duration of a residency is 2 months. Applicants from all over the world may apply. Grants: No grants are currently available; selected candidates are issued a letter of support for individual grant-seeking. Costs: Studio and living space rent is 412 EUR/month (June-September) and 312 EUR/month (October-December), including all taxes, use of equipment, communal spaces and bicycles. The international symposium is a part of the Swiss-Lithuanian cooperation project On Hosting and Displacing. The format of the symposium contributions is open: talks, presentations, artistic interventions, workshops, etc. We are looking for interns to work as a) assistant curators, which includes coordination of artist-in-residency and other culture & education programmes and b) visual communication assistants (photo & video documentation and working with our archive). We offer a unique experience and reference letters for your future career, as well as free accommodation at the Colony between September 2013 and May 2014. You should stay for four to eight months. Please send your CV and a short motivation letter to vytautas@nidacolony.lt until February 15, 2013. For more information, please visit our internships page. NAC is also waiting for your proposals to make an event (63-bed guesthouse and three conference/workshop spaces). Our information partners: www.echogonewrong.com, www.artnews.lt, and www.neringafm.lt.